And unceasing handful of adventures await tourists who flock the the small town in Quezon facing the Pacific Ocean. It is approximately 133 kilometers from Lucena City, 136 kilometers from Manila and 42 kilometers away from Famy. Laguna. Infanta, Quezon is 148 kilometers away from Manila. It has 17 barangays and the second largest in total land area in Quezon. Real is also the gateway (port) to Jomalig Island (5-6 hours), Cagbalete island (4 hours) and Polillo Island (2-3 hours). If you are traveling in a group, you can rent a van for P4,500 and contact Sir Ryan 0920-260-8471. After the Jomalig experience, I decided to explore Real, Quezon. Thanks to Red Chuca (aka Adobo Journey), I was able to get the details from my Real, Quezon adventure. Going to Real, we used Option 1 in our tour for Jomalig. From Jomalig Island, we arrived at the port of Real 5:30 pm and went straight to Eva's Canteen situated in the middle of the town, took our dinner and I bid goodbyes to my co-travelers. Without wasting time, I immediately went to Puerto Real Resort (042-536-6358 / 0910-295-8860), my accommodation for that night. I learned in my Camiguin adventure that before 5 pm, a traveler should already have his place to stay. In Camiguin, I looked for my stay past 7 pm and I was able to get a homestay around 10 pm. There is another lodging available named - Club Manila East Pacific. But I decided to stay in Puerto Real Resort since its price is cheaper and more affordable. Prices in Puerto Real for non-aircon is P300 and P400. While for aircon accommodation ranges from 1,000 - P3,500 depending on the size of the room. I was able to hire Sir Danny (0910-332-6793) as my driver/guide for my tour of the waterfalls in Real. I hired Sir Danny for P400.00 only. Sir Danny is known as "Cute na Pasaway," having it as his tagline in his tricycle. I booked myself in a P400 fan room (P300 room was occupied) and waited for the electricity. I thought the day was over! But after the brownout, I found out that Chef Arvin and Francis, two of my companions in Jomalig, were also staying in the same hotel and booked adjacent to my room. And we went to the nearest store and consumed 15 bottles of beer. The following morning, Sir Danny arrived 6 am and we went to our first destination. The Cawayan Falls is just 5 minutes away by foot from Puerto Real. According to the locals, there are 5 small falls in the vicinity and we started our trek to the falls. After 12 minutes of walking, we reached the first falls. Then, we continued our ascent and after another 12 minutes we reached the third and fourth falls. The trail was wet that day and very difficult. Falls no. 4 was the highest and the most difficult to reach. After seeing the fourth falls, we decided to go back. It took us 25 minutes to reach the fourth falls. Cawayan Falls offers the best trekking experience among all the falls and the best nature tripping experience. There is no entrance fee. I boarded the tricycle and went to our second destination - Balagbag Falls. Balagbag is 16 kilometers away from the town or 15-20 minutes of travel using the tricycle. It is the number one falls in Real, Quezon. It is number in terms of its height and its cascading falls. Entrance fee for adult is P20.00 and P10.00 for children. After less than 3 minutes of walking, we reached Balagbag Falls situated at Brgy. Malapad. Cottages are available in vicinity for P300.00. There are also public comfort rooms available for tourists. Contact person for the resort is Mrs. Elecinita Aceboque (0912-229-4894). Best time to go Balagbag falls is during rainy season when the current of the water is strong and the cascading effect of the falls can be fully seen by tourists. The sightseeing will not be complete unless I go to the second level off the waterfalls and I did. It was a little bit slippery but manageable. After staying for an hour at the site, I decided to go to the last waterfalls. Our last destination is just 1 kilometer away of rough road from Balagbag Falls. Along the way, you can see the coastline of Real, Quezon and Cagbalete Island. Entrance fee in this falls is P20.00. The trek to the falls is more or less 10 minutes only. Cawayan Falls has the longest trek while Balagbag falls has the shortest. We had to cross first the river before we were able to get to the trail. Nonok is also situated in Barangay Malapad. And after minutes of trek, we reached - Nonok Falls. Although Balagbag offers the best view, Nonok offers the strongest flow of water and is the best spot to take a swim! I took pictures and afterwards, left the site. Along the way back, I asked Sir Danny about the best resorts in Real and he gave me two names situated in Barangay Tignoan. The first one is - The Park. The Park is the only resort which has both the salt and fresh water swimming areas. It is open 6 am and closes at 10 pm. Contact person is Mr. Teody Villaflor (0920-924-6102 / pacificrecreationkamp@gmail.com). I tried to do river tubing but according to my guide, it was not possible that day since the current of the river is not that strong. Best time to enjoy it is from September to December when the flow of the current in the river is strong and overflowing. The other resort is La Juliana. After 4 hours, I was able to finish my tour and went straight to Lucena. But this time, I used Option 3 for the trip back to Batangas. I had to experience the route. 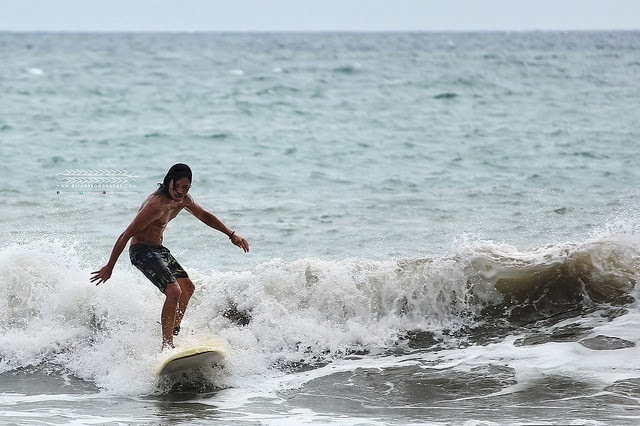 It's Really More Fun in Real, Quezon! hi po,ganda ng blog...ask kpo ko,san po un terminal ng mga van n byaheng infanta na my way sa real? 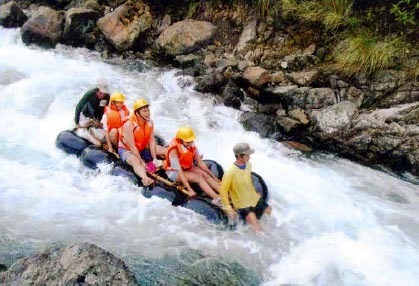 River tubing is best enjoyed during rainy season when the current of the river is strong and that is the reason why I was not able to do it last May. On the other hand, am not much of a surfer and my knowledge about this is limited. But it requires strong waves. it was nice run into and met you in person...see u in our next travels po...just continue what ur doin nw,i salute u! Thanks for sharing, this was really helpful for those who want to travel in Quezon. You may also like to travel in Batangas and check the beach condos at Playa Calatagan Residences and enjoy the beach life. Hi! My name is Adreana Remo from DENR. 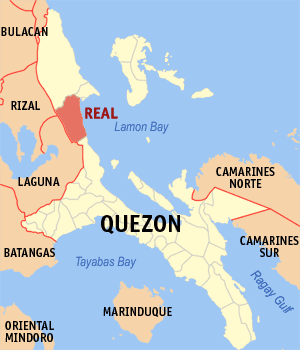 I saw your photos of Real Quezon. I would like to ask if you would be interested to contribute photos for the Coffeetable book that we are making. The book will feature the 17 protected areas in calabarzon region and one of the highlights of the book will be the ecotourism sites that are found in the area. Hope to hear a positive response from you. And we hope that you could help us in showcasing the beauty of CALABARZON thru this book. Thank thank you very much po! super nice! thanks for all the info, ask ko lang, available time and interval ng van please..
hello sir .. nice blog po .. git some questions lang po .. may biahe ba ng 2-3 am na pa infanta sa sta mesa ? we are nit sure din kasi ng kasama ko ..
dun po sa falls , gang what time sila bukas sa public ? lastly may mga room for two ba dun sa "the park" just in case na umulan at d makarent ng tent ?? Great information about Quezon travel. For everyone who need to know about price of Manila airport shuttle, please contact with GoAsiaDayTrip - the most trusted airport transfer and day tour company in Southeast Asia.